Number Ten is a stunning luxury self-catering apartment situated on the edge of Loch Dunvegan in North West Skye. This cosy island retreat has been turned into an oasis of calm and sophistication by its owners Alan and Diana, whose creative talent is evident in the gorgeous interior design and attention to detail. Number Ten is adjacent to Diana’s studio and gallery. Diana Mackie is a recognised contemporary artist whose work is heavily inspired by the fabulous position of her home which looks out to the Outer Hebrides. 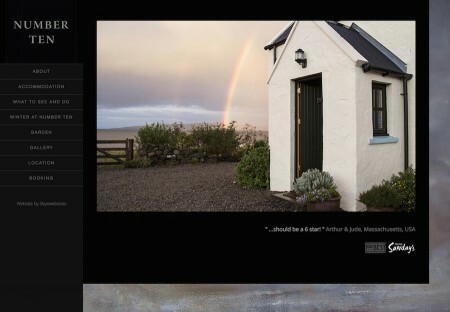 Her paintings explore the changing seascape and climate and the unique and beautiful light on Skye. We were delighted to be asked to get involved in designing an e-commerce website for Diana’s work as well as a website for Number Ten. Utilising Diana’s distinctive paint strokes and colours, we created two linked sites. 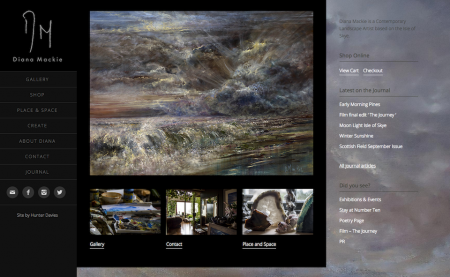 With WordPress as the content management system, the sites are mobile responsive with a sober and sophisticated black background to enhance the beauty of the images on display, be they Diana’s paintings or the natural beauty surrounding Number Ten. This design continuity mirrors the physical and personal proximity of two key aspects of life on Diana and Alan’s croft.